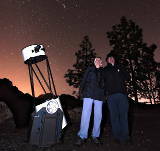 In addition to the astronomy workshop you will discover the breathtaking landscapes of the South West of Gran Canaria. You will be safely driven through narrow curvy roads up to the Pinar de San Antonio area. You will have the opportunity to take astonishing pictures and we will be happy to help you and give some advices if needed. We also attempt to foment chat between guests. We pick you up from your resort in South Gran Canaria approx 90 minutes before sunset. You will be offered a free drink during a chat stop in Mogan village. We will introduce ourselves. We like to know more about you and other guests. After a ride through amazing landscapes, you will have the opportunity to take pictures from the Mulato viewpoint overlooking Mogan valley at 700m altitude. Depending on the clouds, winds and observable objects we will take you to the best observing point in Gran Canaria and mount a huge Dobsonian telescope for every 8 guests. Possible pickup in Playa de Arinaga. Possible pickup in Cruce de Arinaga. Possible pickup in Bahía Feliz. Possible pickup in San Agustín. Possible pickup in Maspalomas & Playa del Ingés. Possible pickup in Mogan & Taurito. Important: We use small buses to save your time. The total number of stops for picking up people is an average of only 3. Photo stop at Mulato viewpoint. Presa del Mulato observing point. You can have a small walk next to the lake while we are mounting telescopes if you want. Quite protected from strong winds. A bit of light pollution to the South due to Mogan village. Likely to be cloud covered if the sky is not completely clear or if the wind blows from South. Cruz de San Antonio observing point. Good view on the half South of Gran Canaria (it helps to take a decision about moving to another place). The ground is not perfectly flat. We cannot go there if the wind blows strong from North as this point is likely to be windy. Presa de Las Niñas observing point. Good view on the half South of Gran Canaria. Quite a long road trip. GC-605 curve at PK 3.5 observing point. Likely to be just a few meters up to an impressive cloud sea. Poor visibility to North and West. Good views on the half South of Gran Canaria. Likely to be clear and higher than the cloud sea. 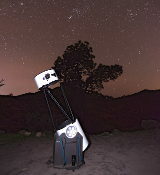 A bit of light pollution from Tejeda and Ayacata.